Three BVI nationals have been awarded The University of the West Indies Alumni Association (UWIAA) Open Campus Pelican Awards for 2018. Mrs. Dancia Penn, OBE, QC, Dr. Heskith Vanterpool and Mr. Gerard Farara, QC are among ten outstanding UWI Alumni recently honoured at a special ceremony in St. Lucia. Other awardees include Dr. R. Alford Walwyn, OBE and Dr. Jillia Bird of Antigua, Dr. Beverley Steele of Grenada, Her Excellency Dame Pearlette Louisy, Dr. Veronica Simon and His Excellency Dr. Didicus Jules of St. Lucia, and Ms. Rene Baptiste, CMG of St. Vincent and the Grenadines. The announcements were made by Chair of the Selection Committee and Manager for the UWI Open Campus British Overseas Territories, Dr. Phyllis Fleming-Banks and the Awards were presented by the Chancellor Robert Bermudez. . The Pelican Award is the highest honour that a UWIAA Chapter may bestow on a graduate of the University. It is conferred on Alumni who have excelled in their chosen fields and have had major positive national, regional or international impact. The Awardees were nominated by their local Alumni Associations and selected by a special Committee, based on the criteria. The 2018 Pelican Awards were also in commemoration of the 70th Anniversary of the UWI and the 10th Anniversary of the Open Campus. 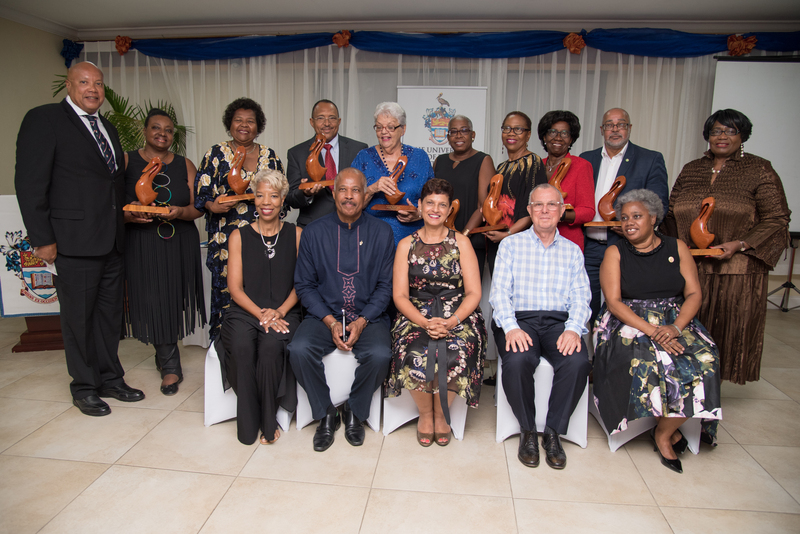 In offering her congratulations, Chair of the Steering Committee of the BVI UWI Alumni Association, Mrs. Celia Georges, said she was delighted that three of the seven nominees from the BVI were selected. She said, “The BVI has featured prominently in the UWI Open Campus celebrations this year, with the conferring of the honorary Doctor of Laws Degree on Dame Janice Mesadis Pereira and the bestowing of the Pelican Awards on Mrs. Penn, Dr. Vanterpool and Mr. Farara. This speaks volumes for the outstanding contributions that our UWI-trained nationals are making locally, regionally and internationally.” Mrs. Georges, who is leading the movement to revitalise the local Alumni Association, is calling all UWI Graduates in the BVI to join the Association.